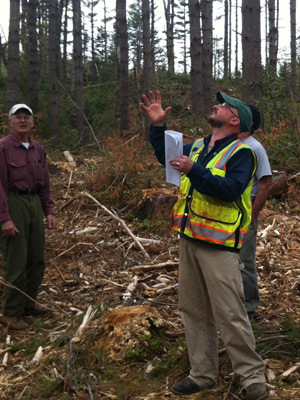 As events related to the Conservation Commission are scheduled, they will appear on this page. 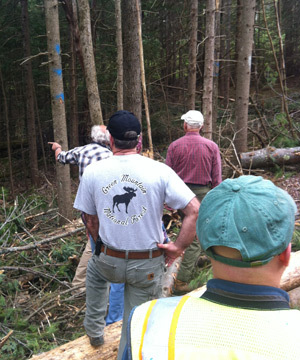 Please check back often or refer to the Conservation Commission page for further information. You may also get a list of members on the Directory page under the TOWN pulldown menu. 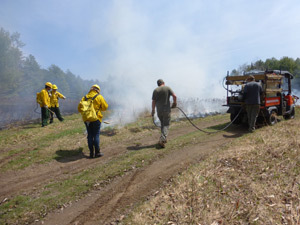 On the seventh of May a crew of fire fighters from the South Londonderry department assisted by volunteers from the Rugg Valley Landscaping Co. and the Londonderry Conservation Commission, all under the direction Kevin Beattie and “Nort” Phillips, began a controlled burn of eight and one half acres of the Prouty property in Londonderry. 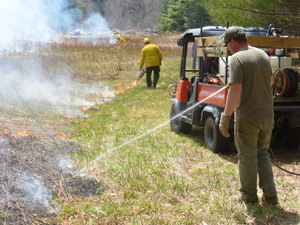 Before beginning the burn the “burn boss,” Kevin Beattie, consulted with the National Weather Service in Albany which recommended as the actual date for starting the burn any acceptable burn window occurring between the dates of the seventh of March and the twelfth of May. Kevin’s choice of the seventh of May turned out to be fortunate; the wind was light and the weather fair. 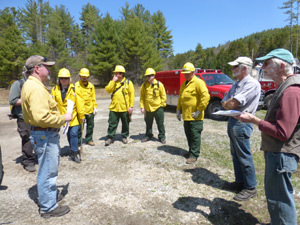 Around noon Kevin briefed the crew about their separate responsibilities, pointing out that a border had been mowed around each of the three areas to be burned to keep the flames within the prescribed area. 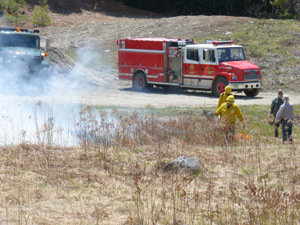 Shortly thereafter the diesel torch bearers set fire to the first area.